In a move that will upgrade their defense a great deal, the Bengals are getting back linebacker Odell Thurman, as he has been reinstated by the league after two years away from the game. Thurman missed the last two seasons due to violations of the NFL substance abuse policy. The Bengals put out a statement about their LB coming back to the team earlier today. It is a sigh of relief for Thurman and the Bengals for him to be back in the league, as it was the second time that he had applied to be back on the field. Many felt that he would be reinstated last year, but instead he was handed another year suspension by NFL commish Roger Goodell. 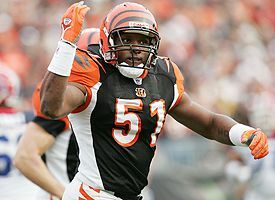 He was the Bengals 2nd round draft pick in 2005, and led the team with 148 tackles, as well as four forced fumbles, and his five interceptions tied for the most for an NFL rookie that season. Defense has been a big issue for the Bengals and with Thurman back in the fold, the team should be headed back in the right direction in that regard. Expect him to quickly re-establish himself as a force for the Bengals defense. What are the bengals going to do about Odell Thurmans felony assault with specs. in erie county ohio indicted july 9 2008.I dont think the guy knows how to stay out of trouble kick him out of the game for good.